The great artist Michelangelo, while realizing ‘Moses’ and ‘Pietà’, never run short of the ‘Casciotta of Urbino’ cheese : on the contrary, he was so fond of this product that bought several pastures in the municipality of Urbania, in order to have always the fresh milk necessary in order to produce it. Characterized by a very aromatic character, because it preserves scents of milk and fresh spring herbs, the Casciotta d’Urbino cheese is very appreciated for its versatility in cooking, which makes it suitable for both snacks and the most refined dishes. 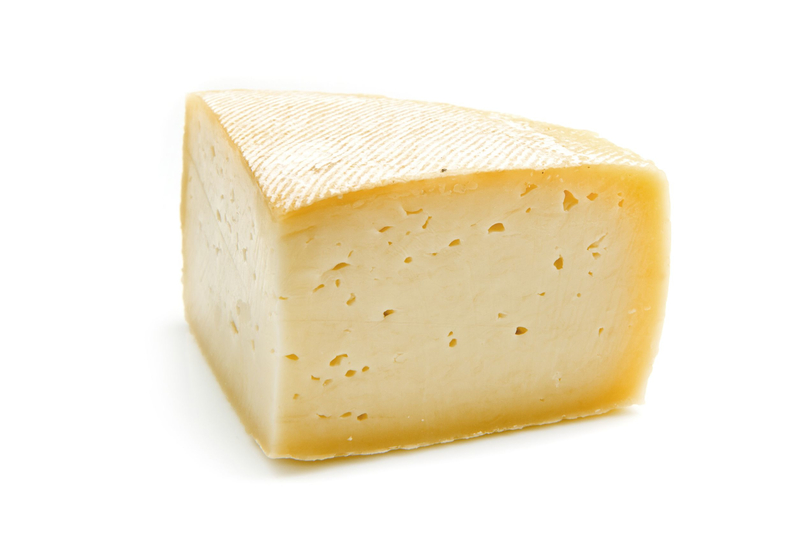 The Casciotta is produced for 3/4 from sheep's milk and the remaining part consists in cow’s milk. The result is a nice mix of sweet and sour flavour, typical of fresh milk. The name 'Caciotta' refers to a cheese characterized by round shape, basically low, rounded on its sides, whose weight is of about 1kg, not very seasoned, with a mostly sweet and delicate flavour. On the other hand, the ‘Casciotta', with a ‘s’ in its name, exists in the variety typical of Marche only, characterized by full-bodied and tasty flavour, but always light, thanks to a delicate ripening, which lasts two weeks only. The control of animal feeding for assessing the milk used in order to prepare the ‘Casciotta’, as well as humidity, is rigorous and scrupulous. So, it can be recognized among the many excellences of Italian cheeses. The cheeses are rounded, their crust is thin, and their paste is pale yellow. Their soft and at the same time crumbly texture enhances the full, definite flavour of this cheese. Dry salting carried out by hand concludes this production. The cheeses are then wrapped in paraffin in order to prevent dehydration and their sizes range from 800 to 1,200 grams. The brand shows Michelangelo’s face with a background of medieval tapestries, in order to remind consumers about history and land from which this cheese was born. The land from which this cheese was born is well recognized as a Unesco world heritage and is a succession of green and fertile hills ranging from the Apennines to the Adriatic Sea. 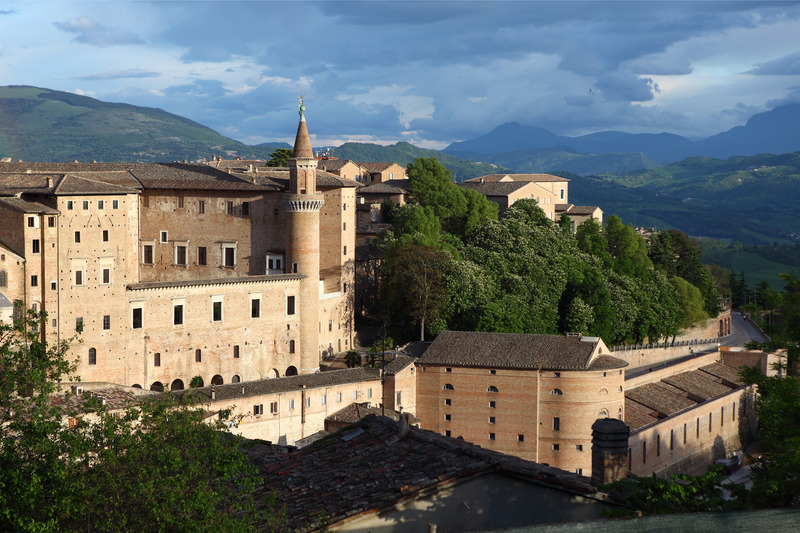 Urbino, the capital city of Italian organic production, is a town of culture, but it also offers wine, cheese, and pasta. Fresh Casciotta is the basis for many seasoned ‘formaggi di fossa’, a typical production of this land. This geographical area has always been characterized by an agricultural vocation, as its microclimate is steady thanks to its shape: its winter is always rigorous and snowy, followed by a dry and cool spring. So, a spontaneous growth of fresh herbs is allowed and they give their characteristic flavour to sheep’s milk. ‘Casciotta’ is closely linked to the economy of this area, which is one of the main destinations for country tourism in Europe. The Consortium which gathers local producers organizes for this delicious fresh cheese a festival that is held every year in May. It opens the season of food-and-wine tourism in the Marche region. Depending from the year, the production of this cheese varies from 200 to 300 tons. Until the early 2000s, more than 90% of it was absorbed by Italian market. In recent years, however, the export has increased, especially towards Eastern Europe. 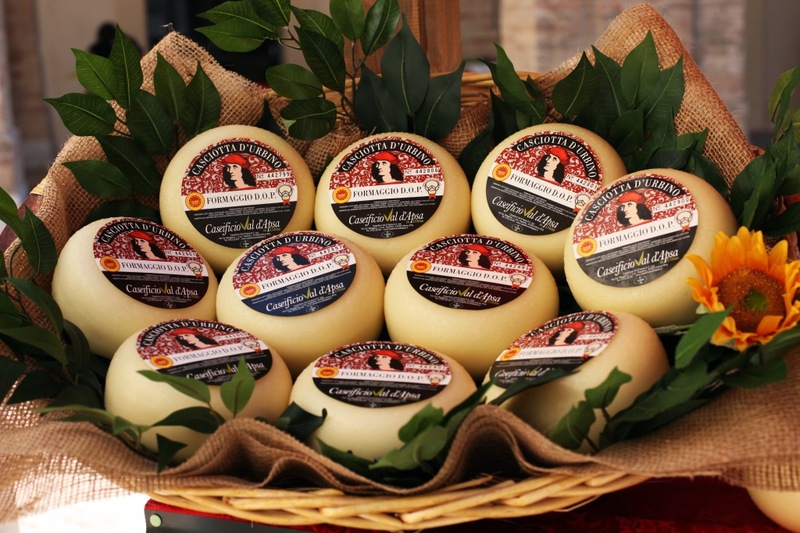 So, the Casciotta d’Urbino is one of the most exported cheeses towards Russia, whose export follows that of Parmigiano and Pecorino. Its presence is steadily increasing in the markets of Germany, Switzerland, and Austria too, thanks to the link of these Countries with both farm holidays and organic productions in the Marche region. It is traditionally eaten with white bread without salt, accompanied by broad beans, sausage, cold cuts, bacon, ham. It can be used for preparing all the dishes based on eggs or ham, in order to flavour grilled ‘polenta’, or eaten as a main dish, accompanied by fresh vegetables. If it is eaten after a meal, it should be cut into very thin slices, placed on a serving plate, and combined with jam, marmalade, honey or caramelized figs. A typically Italian pairing is with pears. The suggested wines for accompanying it are ‘Rosso Piceno’, ‘Sangiovese dei Colli Pesaresi’, ‘Torgiano Rosso’, and ‘Vino Nobile di Montepulciano’.